Note: Compare todays workout to April 29, 2016. This workout was originally known as the “CrossFit Challenge” and is an awesome session. Larger classes will use the Krav Maga gym for Pull-up bar space. 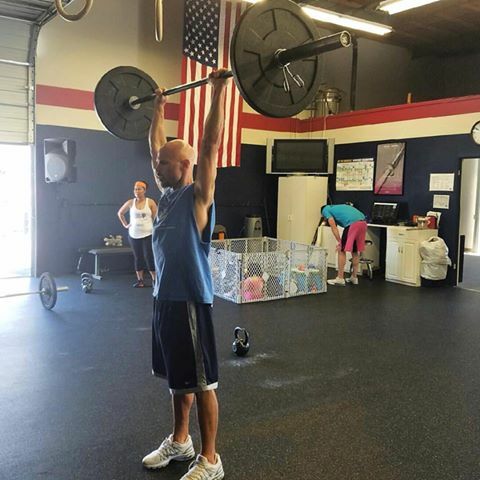 Congratulations to James who was recognized as Athlete Of The Week at CrossFit Amundson. James is an Advanced Graduate of the “Musha Shugya”, a grueling 12 hour series of physical evolutions, and a Veteran of the United States Navy. James is taking place in the “Journey For A Change” event, in which he is walking from Santa Cruz to Sacramento to raise awareness for suicide and PTSD in Military Veterans. Along the way, James is stopping in every CrossFit gym be can, and participating in a workout with the friends he is making. James is one of the most encouraging, motivating, and kind Athletes at our gym. In addition to his incredible work ethic, James is the first Athlete to cheer on the person next to him. James has a big heart for helping other people, especially his fellow Veterans. Keep up the inspiring work James – we love you brother!